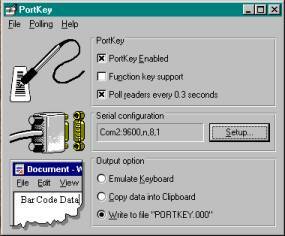 PortKey for Windows® allows users to attach serial devices to an RS-232 Com Port on a computer running Windows and have the data emulate a keyboard. This is especially useful when a Keyboard Wedge Reader can not be used on Laptops and other non standard computers that only have a serial port and/or don't have a USB port. PortKey for Windows also has a built in polling function to allow multiple WDR readers or Older T5x TriCoders to be daisy chained off one COM port. This is an advantage for attaching more than one reader to a single computer.